What if I told you that you could generate 63% more traffic to your website and increase your conversion rate by 12%, just by using Adwords Ad Extensions? Now, what if I told you that you can do it in the next 10 minutes? But the truth is, most advertisers are still not using all 12 Adwords Ad Extensions to get these off-the-chart results. Adwords Ad Extensions allow you to extend your ad to show other relevant information alongside your core advert on Google. For example, here are 6 common Adwords Ad Extensions that you probably see on a regular basis. Adwords Ad Extensions allow you to provide users with what they want, faster – whether that be directing them to a certain URL on your website, displaying directions to your closest branch, or simply giving them the number to call you without them having to search through your website. In addition to these benefits, using extensions also allows your ad to occupy more space on the first page of Google, making it stand out even more and giving it a greater chance of being clicked. Pretty impressive when you consider these can be implemented within just a few minutes. 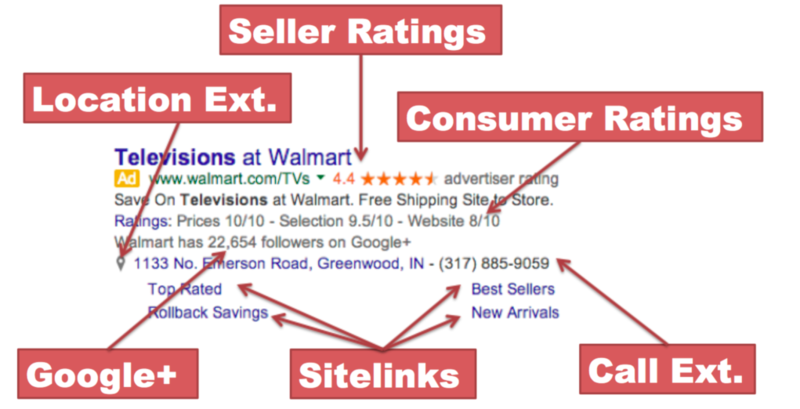 Where are Adwords Ad Extensions located? 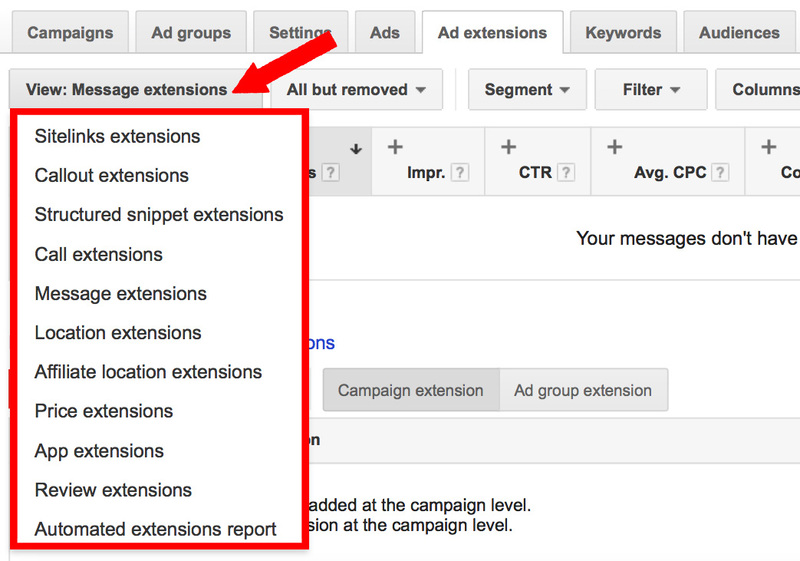 Adwords Ad Extensions are located within the ‘Ad extensions’ tab of your Adwords account. All of the manually created Adwords ad extensions can be accessed by using the view dropdown. Along with these manual Adwords Ad Extensions, there are also 4 automated advert extensions that Google apply. All of these can be viewed by clicking ‘Automate extensions report’ in the drop-down menu. Sitelink ad extensions allow you to add extra content underneath your advert, which directs users to the most relevant landing page on your website. Here’s an example of ACME using this feature. This Adwords ad extension allows you to occupy more space on the first page of Google, increasing the chances of your advert being clicked on. You can also add two lines of description within your ad extensions, creating what’s known as ‘expanded sitelink extensions’. Here’s an example of Nike using this feature. However, note that expanded sitelink extensions will only show in some searches, and are most commonly seen when users are searching for your brand. Sitelink extensions are very effective at increasing the likelihood that somebody will click on your advert. Data from Google suggest that sitelink extensions increase CTR by 20% for non-branded searchers (where a user makes a search that does not contain the name of your brand), and up to 50% when users search for your brand. 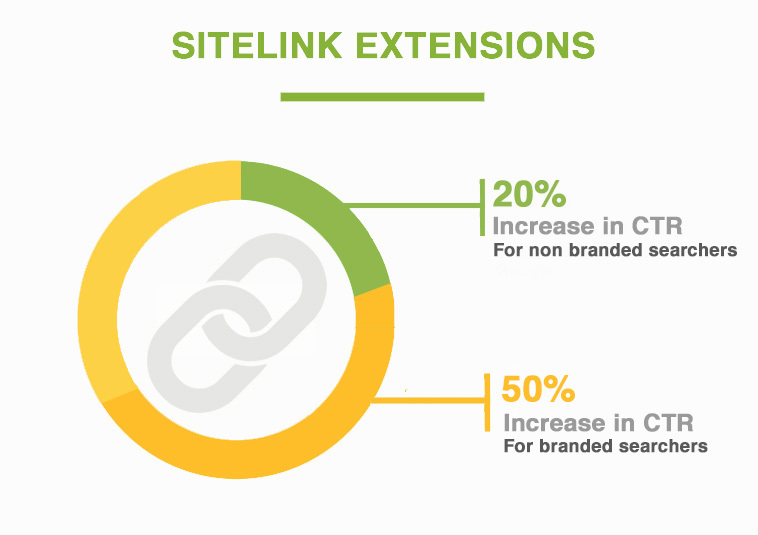 To reiterate – Sitelink extensions take just a few minutes to set up, and yet they can increase CTR by as much as 50%! 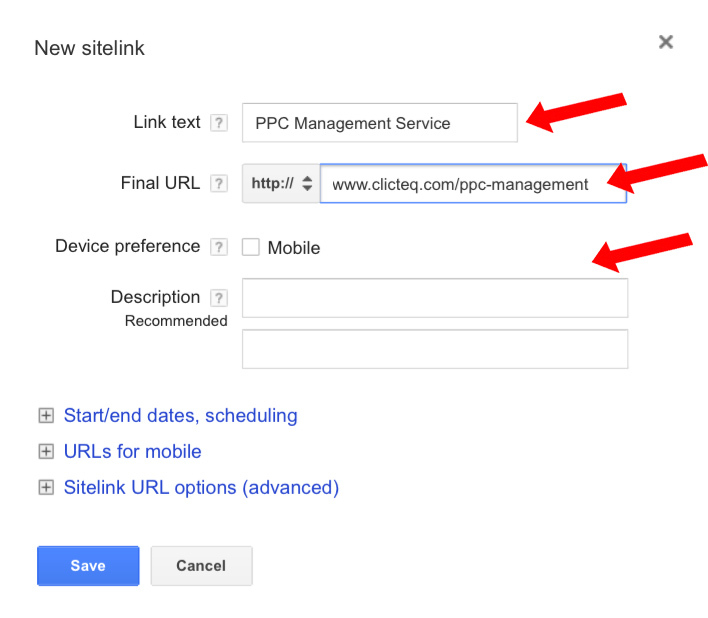 To add a new sitelink, simply fill in your ‘Link text’ (what you want the hyperlinked sitelink to say), and the ‘Final URL’ (the web address you want users to be redirected to if they click on your sitelink). If you just want to run these on mobile devices, you can select this as a device preference. Once you’ve filled in these terms, you can add a description which will show alongside your ads in certain searches (mainly branded searches). As with all Adwords Ad Extensions, you have several advanced settings including scheduling, mobile URLs, and ad parameters which you can play with. Callout Extensions allow you to add features and benefits below your advert that you were unable to include within your ad copy. Here’s an example of Zuility using this Adwords Extension effectively. Setting up Callout Extensions is quick and easy. Simply enter your callout extension text (up to 25 characters) and you’re done! As usual, you have all the different advanced settings (under ‘Start/end dates, scheduling’). 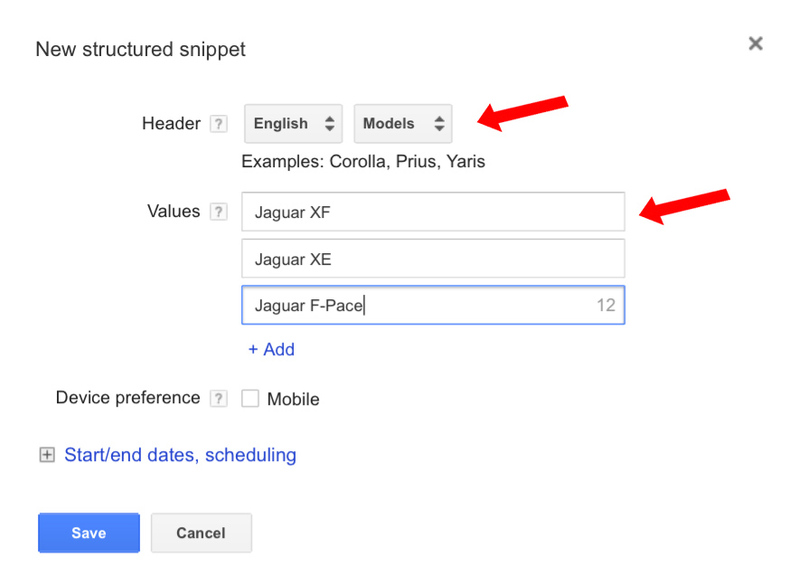 Structured Snippet Extensions allow you to show additional features alongside your advert. Here’s an example of ACME Travel using them effectively. The Structure Snippet Extension also allows you to occupy more space on the first page of Google, giving you the opportunity to display features and benefits that you might otherwise not be able to. According to data from Google, they saw increases in CTR between 9 and 12% when Vodafone implemented this Ad extension. To set up this extension, select the language you want your extension to appear in, and then select a header. You have a wide choice to choose from (Amenities, Brands, Courses, Degree programmes, Destinations, Featured hotels, Insurance cover, Areas, Service catalogue, Shows, Styles, Types). Once you’ve done this, enter at least 3 values which can be up to 25 characters long. These values are what you want to display. For example, I selected the header ‘Models’, and then entered different models of Jaguar cars. 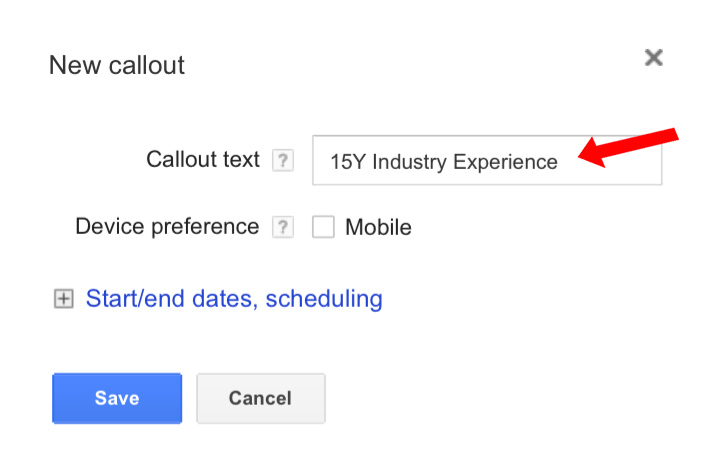 As usual, you have the advanced Adwords Ad Extension settings that allow you to schedule your extension and set a device preference. 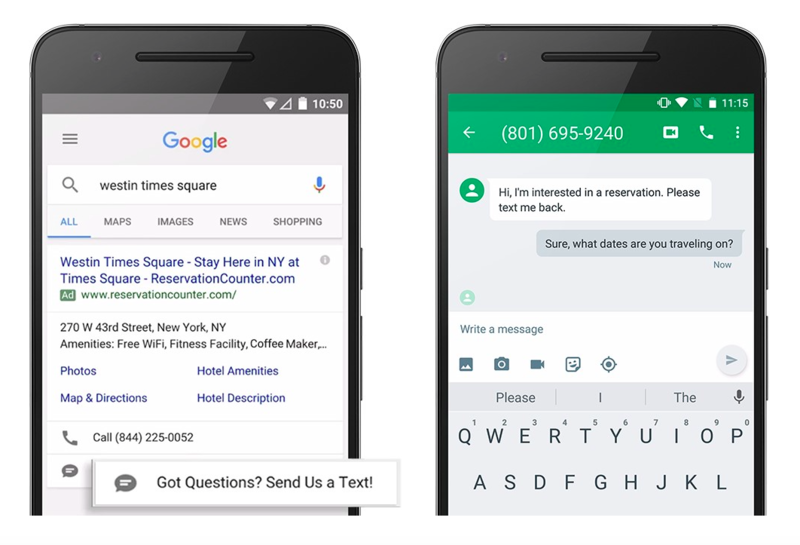 Message Extensions allow searchers to text you on their mobile device to request more information. Here is an example of Reservation Counter using this feature. 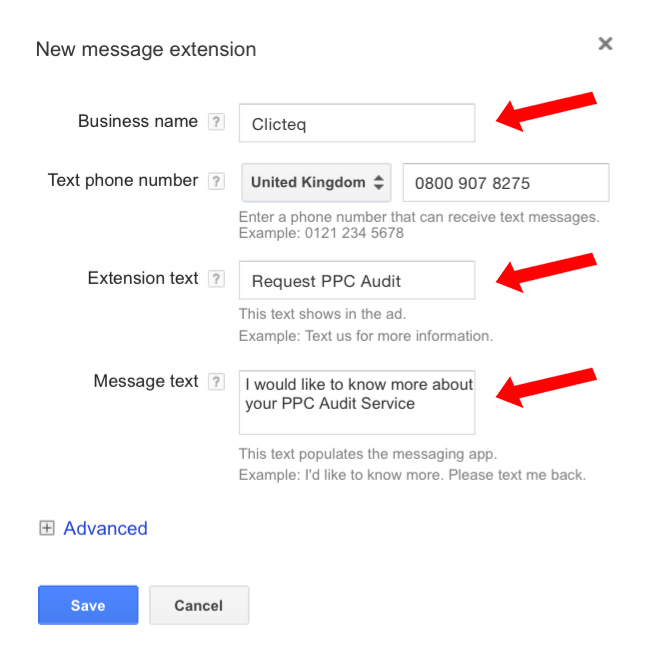 Before setting up this type of Adwords Ad Extension, you need to make sure that you have a business phone number you can receive texts on. Once this is in place, all you have to do is enter your business name and telephone number to get started, as shown below. The ‘Extension text’ is the text that appears alongside your advert. In the example by Reservation Counter, as seen above, you can see they use “Got any questions? Send us a text” as their extension text. The ‘Message text’ is simply the message that is pre-populated within the searcher’s phone when they select the option to send a text. Price Extensions allow you to show the price of your products alongside your adverts. Here’s an example of price extensions being used effectively. The ‘Header’ appears above the price, and the ‘Description’ appears below. Note that if your Header spans over 20 characters, it will become truncated (see right-hand side of the image below: “PPC Management S…”). The ‘Units’ setting allows you to specify whether the given cost is per month, day, week, hour, or night, for example. If none of these apply, you are able to leave this setting bank. The ‘Final URL’ is simply the web address where the product or service can be found. As with all of the other Adwords Ad Extensions, you can customise scheduling as well as URL parameters using the advanced settings. In contrast, here’s how Call Extensions look when browsing on a mobile device. Here a searcher can simply click on the call button and it will call your business. Call extensions can literally be setup in about 30 seconds flat. All you have to do is select the country that your phone number is from and enter it and you are good to go. 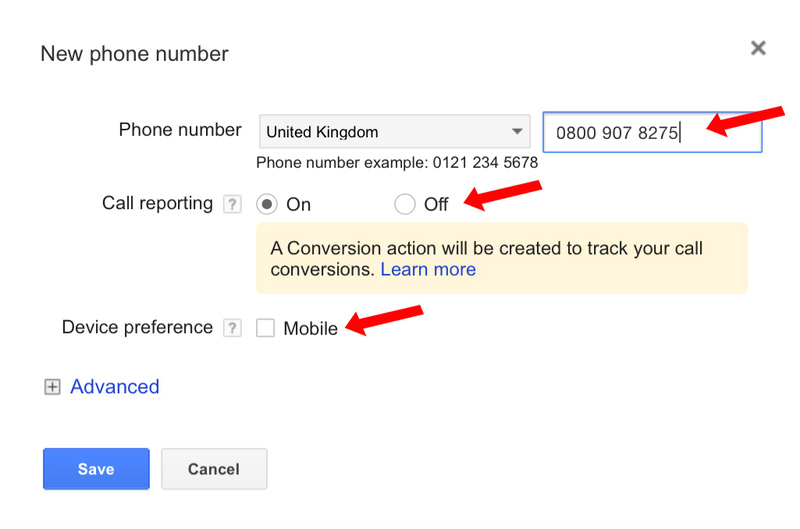 You can, if you want (and we would recommend it), use ‘call reporting’, which allows you to track which calls are generated from people clicking on the ‘click to call’ button showed above, and register it as a conversion in Adwords. If you wish, you can also select ‘mobile only’ if you want your ads to be shown on mobile devices only. Review Extensions allow advertisers to display strong independent 3rd-party reviews alongside their adverts, which helps to gain trust and increase conversion rates. Here’s an example of OpenTable using review extensions effectively. According to case studies by PPC Hero and Netmedia planet, review extensions increase CTR by between 7 and 11%. 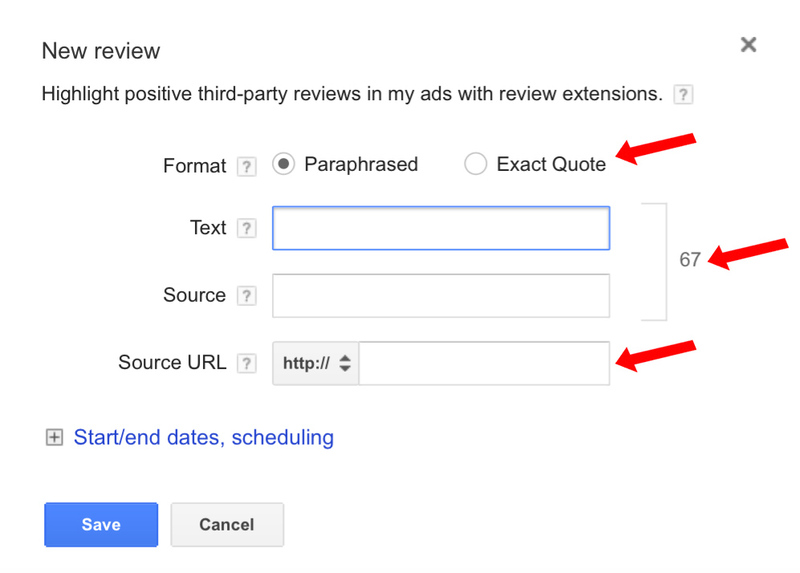 Review extensions are on the harder side to get approved when compared to other types of Adwords ad extension. You need to make sure that the review you’re trying to use is from a reputable 3rd-party, such as an award or certification, as opposed to a customer review. You can then choose to either quote it directly, or to paraphrase it. This is where a lot of people go wrong. To help you out, you can check out this detailed guide to review extensions which contains several examples of what is and is not acceptable. Once you’ve done this, add the name of the source. For example, if the review was by Gartner, you would write “Gartner” as the source. Finally, enter the source URL, which is the web address where the review is located. App Extensions allow you to display your app alongside your adverts, allowing users to download it from the iOS or Android app store without having to visit your website. Here’s an example of Amazon using this feature effectively. 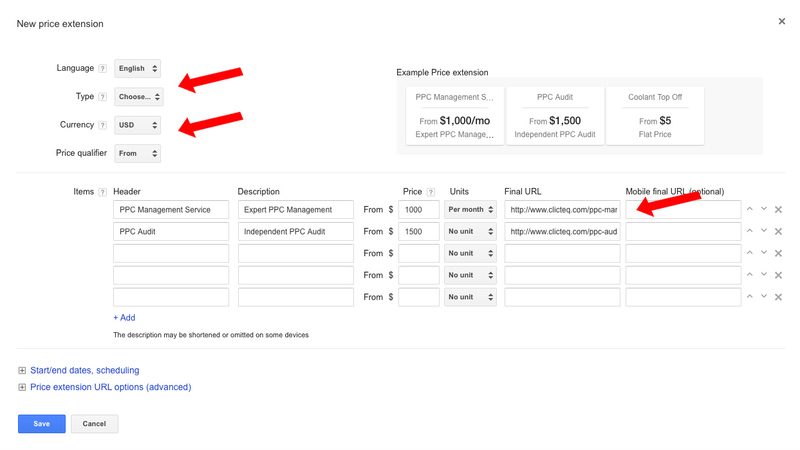 This Adwords ad extension can be setup in a few simple steps. 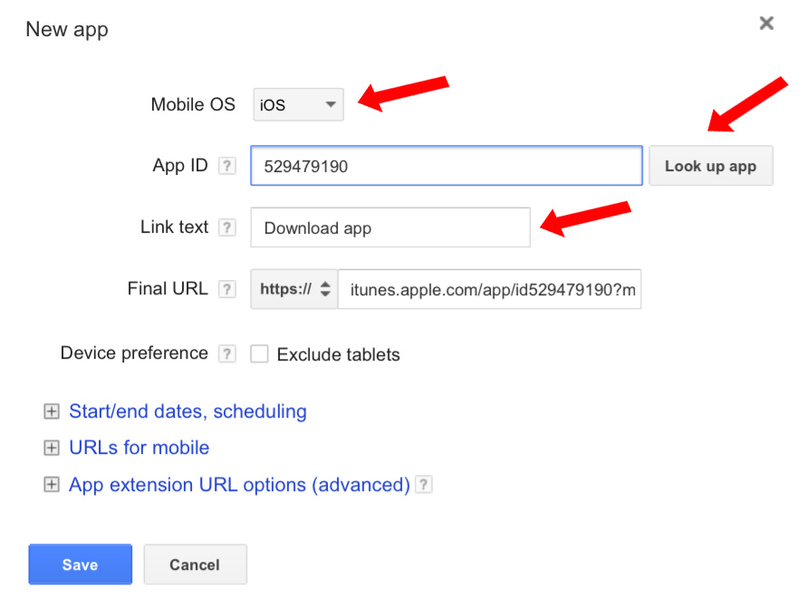 First select when your app is hosted, whether it be Android or iOS. Then, in the ‘App ID’ field, either type the App ID (if you know it), or simply click ‘Look up app’ to search for the app’s name. Once you’ve done this, you have the option of changing the link text. This is the text that users viewing your app will see. For example, in the advert above, Amazon use “Get the Amazon Mobile App” as their link text. More advanced users may also want to set a device preference (e.g. so the ad is only shown to users on mobile devices rather than desktop), or use a schedule (so your Adwords ad extension is only shown at certain times of the day, or on certain days of the week). Seller Rating Extensions allow you to display review stars below your advert, which helps you to gain trust from users as well as helping your ads to stand out. Here’s an example of CustomInk using Seller Rating Extensions effectively. To show Seller Rating Extensions, you need to acquire 150 reviews on any one of these Google approved review platforms. If you need help in reaching 150 reviews, consider simply emailing your existing customer base and asking for a review. Data from Google shows that Seller Rating Extensions increase CTR on average by 17%, whilst research from Trustpilot shows that they can increase conversion rates by up to 12%. Seller ratings appear automatically alongside your adverts once you have received 150 verified reviews from one of Google’s approved 3rd-party review providers. We like to use Reviews.co.uk, because it’s cost effective and simple to use. You can compare the different providers using this comparison chart put together by CPC Strategy. 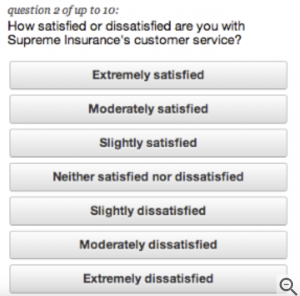 Consumer Rating Extensions are similar to Seller Rating Extensions, and allow you to show your customers’ satisfaction out of 10 for criteria such as service, delivery speed, and ease of returns. They help to build trust with searchers, and increase that chances of users converting. Here’s an example of plus-size women’s swimwear brand Marisota using this extension effectively. This Adwords ad extension requires no setup, and the ratings are automatically calculated by Google using information from surveys (which you might have seen as you browse online), which look like the example below. The categories will be different depending on your type of business; for example if you sell insurance, there might be a ‘claims handling’ rating instead of something like ‘delivery speed’. This is an automated extension that Google will add to your adverts automatically. It works in a similar way to Sitelink Extensions, and will direct users to the most relevant page on your website. Here’s an example of Easton Sport using Dynamic Sitelink Extensions. You don’t need to do anything to enable Dynamic Sitelink Extensions – Google will show these automatically. To review the performance of your Dynamic Sitelinks, navigate over to the ‘Automated extensions report’ in your account. This is another automated extension that Google will add to your adverts automatically. It works in a similar way to Callout Extensions, and will display relevant features below your ad copy that you would not otherwise have room to include. Here’s an example of Acme Travel using Dynamic Structured Snippet Extensions. Again, you don’t need to do anything to enable this extension; Google will show these automatically. There you have it – you should now have everything you need to know in order to generate 63% more traffic to your website and increase your conversion rate by 12% using Adwords Ad Extensions! Almost every time I audit an account, I find at least one of these key ad extensions missing. It’s frustrating, as you’d need to be hard pressed to find an easier way to significantly increase your CTR by 10%+ in under 5 minutes. Ad Extensions truly are a low-hanging fruit within Adwords that you really need to take full advantage of. Got any questions? Ask them below and I’ll get right back to you! Helpful information aligned at one place. It is reducing lot of efforts searching about Extensions. Hey thanks Wesley for sharing this blog.